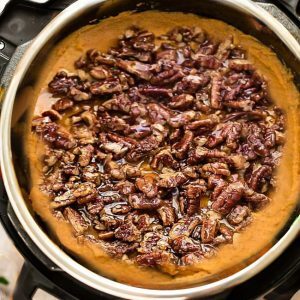 Instant Pot Sweet Potato Casserole - the perfect easy, paleo-friendly side dish for Thanksgiving. Best of all, this healthier sweet potato casserole is made entirely in the pressure cooker, saving you valuable oven space. No pre-boiling the potatoes required! Prep your sweet potatoes (peel & cut them into rough 2" or so pieces) and place them in the Instant Pot along with the water. Seal the lid and turn the valve to "sealing". Press the MANUAL or PRESSURE COOK (High) for 8 minutes (it will take approx. 10 minutes or so to get up to pressure). Once the potatoes are cooked and you hear the beeping sound, do a quick release by pushing the valve to VENTING using a long wooden spoon. Carefully open the lid and test to make sure potatoes are done by poking one with a knife. If they're not done, put the lid back on and cook them on high pressure for another 2 minutes. Carefully take the inner cooking pot out of the Instant Pot and drain the liquid. Add the milk, coconut oil, maple syrup, vanilla, and egg to the drained sweet potatoes. Using a potato masher or immersion blender, mash the potatoes until they are smooth. Add more milk (1/2 tablespoon at a time) if mash seems too thick. Smooth the surface. In a large bowl, combine pecans, oil, maple syrup, flour, cinnamon, nutmeg and salt in a medium bowl. Spread the pecan mixture over the sweet potato mash. Set Instant pot to SAUTE (less) and cook for 5-10 mins or until the potatoes are heated through and the top becomes bubbly. Keep the sweet potatoes on 'keep warm' mode until ready to be served. Transfer sweet potatoes into a casserole dish. Spread the pecan mixture over the sweet potato mash. Bake for 8-10 minutes in a preheated oven at 400°F, or until browned and bubbly.